- Select Option -8 lb.10 lb.12 lb.15 lb.20 lb.25 lb.30 lb.40 lb.50 lb.60 lb.80 lb.130 lb.150 lb.180 lb.200 lb.100 lb.300 lb. 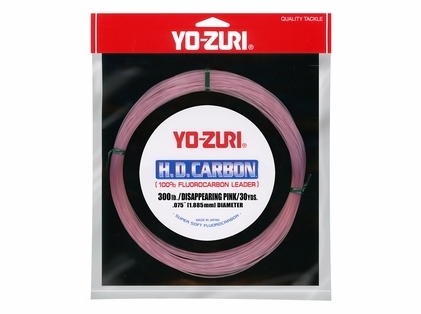 Yo-Zuri HD Fluorocarbon is a brand new fluorocarbon leader that maximizes the advantages of fluorocarbon and a Disappearing Pink tint. Fluorocarbon is virtually invisible in the water and red is the first color to disappear in the water column. Pink is the lightest shade of red and as a result disappears the quickest. Fluorocarbon is also only invisible until it gets nicked or scraped up. If this happens, that section of the leader actually lights up from the sunlight. The color pink added to the line helps reduce this problem keeping an anglers invisibility intact. Ultimately the combination of fluorocarbon and the color pink will double your invisibility advantage and increase your chance for hookups! Yo-Zuri HD Carbon has incredible abrasion resistance, ultimate invisibility, higher sensitivity, superior knot strength, and is a softer, more supple material than other brands. 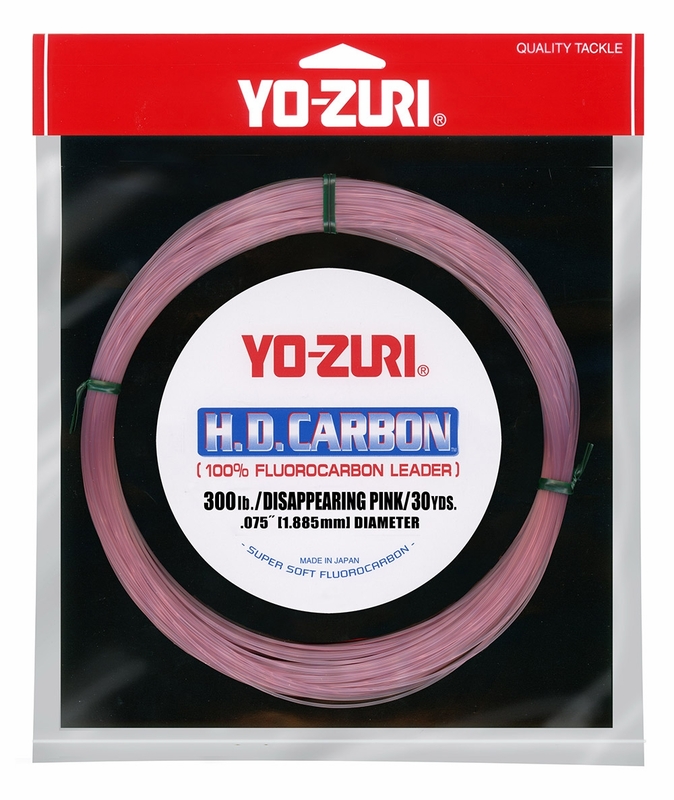 I have purchased and used the Yo-Zuri HD Flurocarbon leader in 30lb and 40lb ratings and while i cant attest to its invisibility in water it is very supple which makes it easy to tie good strong knots in. Not all flurocarbon leader material is this easy to handle as I have used other brands that were so stiff that it was like trying to tie knots in wire. It also seems to be very abrasion resistant compared to nylon leader material. I check the condition of my leaders after every trip by running the line slowly through my fingers feeling for any roughness and this leader material holds up longer than the nylon leaders I used to use. It is a little more expensive than some of the other brands available but like all the Yo-Zuri products available, none are less than premium quality. ProsSupple, easily knottable, resistant to abrasion and supposedly invisible to fish. ConsMy friends all use my leaders. New to Yo-zuri. Will be trying this out on big tuna in PV end of the month. ProsGreat reviews and was recommended this by many others. Will use to rig my Joe Shute/Ballyhoo. Helps conceal the the leader when water is super clear and fish are picky. My favorite brand of fluoro. Wish it was a little cheaper. I tried a few brands of flouro, and this is my favorite. Knots are ok, fairly supple, not excessively expensive but could be cheaper. I've used this in 20/25/30/50 lb test and when I'm not getting bit using other fluoro, this one changes the game. Line shy fish still bite using this. ProsWorks well when others aren't. I use this for any leaders ranging from 15lbs-25lbs, and it's always got the job done. The strength and abrasion resistance are unmatched to anything I have used. It really does "disappear" in the waters I fish and the spool is a convenient size to store and access quickly. The line can get caught up in the spool frequently, but that's probably due to my poor handling of it. I really like this Yo-Zuri fluorocarbon. It has great abrasion resistance. The spool is small and very handy when dispensing the leader especially when you're out wading and have limited space. Produces the results you expect from fluorocarbon. Great buy for the promo price. Holds up well compared to other flouros. I love the DP fluro. fish cant see it and hookups increase with its use. Is this the pink line? Hello Mike. Yes, this is the disappearing pink line.